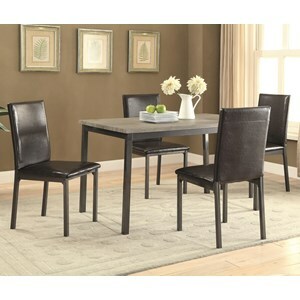 This contemporary styled five-piece dining set centers an elegant rectangular dining table with a beveled edge glass top and textured black metallic base. The side chairs also feature exquisite metalwork treated with textured black finish. Camel microsuede upholstered seats beautifully compliment the glass and metal work. 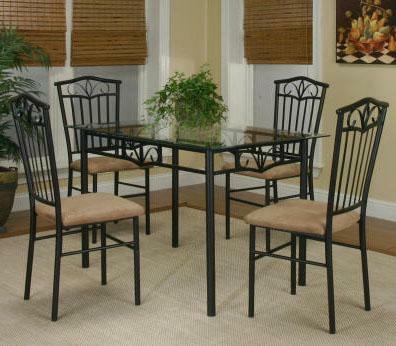 The Cramco Trading Company - Laurel 5-Piece Dining Set by Cramco, Inc at Value City Furniture in the New Jersey, NJ, Staten Island, Hoboken area. Product availability may vary. Contact us for the most current availability on this product. The Laurel collection features exquisite contemporary styled dining furniture that is sure to enhance the decor of your kitchen or dining room. The rectangular dining table contains a glass tabletop with beveled edges that rests upon a textured black metal base with slender legs. Decorative scrollwork adorns the center of each side of the table's base. The side chairs are also crafted with textured black metal which is beautifully complimented by camel microsuede upholstered seats. The Cramco Trading Company - Laurel collection is a great option if you are looking for Transitional furniture in the New Jersey, NJ, Staten Island, Hoboken area.